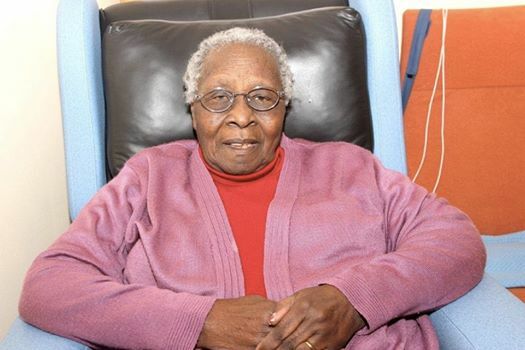 Rosemary Karuga is nearly 90 years old, having been born in 1928. But Kenya’s most senior woman artist is still going strong. She lives abroad with her daughter who ensures she has the peace and quiet she needs to continue creating the art form for which she’s renowned, a painterly style of paper collage. Rosemary was just named ‘Artist of the month’ by the National Museums of Kenya’. Coincidentally, she’s being called a ‘Master Collage Artist’ on the occasion of the first solo exhibition that she’s had in Kenya in a very long time. It’s at Red Hill Art Gallery through December 3rd. Unfortunately, Rosemary wasn’t on hand for the opening of her show October 29th. But as she’s a living legend, being Kenya’s first woman to study in Uganda at Makerere University’s Margaret Trowell School of Fine Art [in the early 1950s], it was sufficient to simply see so many of her collage ‘paintings’ all in one space. Ironically, the exhibition consists of artworks that are not necessarily new. In fact, all 21 pieces have been resident in Kenya for several years. Two come to Red Hill on loan from the National Museum; several more are from Hellmuth and Erica Rossler-Musch’s private collection, and the rest come from the former proprietor of Sarang Gallery, Mahendra Shah. But for me, what matters about her work is not so much the year her collages were conceived as that they are (at least for now) available for our seeing in this country. For ever since Rosemary came out of years of obscurity (starting in the mid-Fifties after she got married, moved back to Kenya and became a humble primary school art teacher for many years), it didn’t take long before she was having exhibitions of her art everywhere from London and Paris to Harlem and New York City. “Elimo [Njau] had known Rosemary in the 1950s when they were both students at Makerere. But it was only in 1987, when [Paa ya Paa] was planning the ‘Women in Art in East Africa” exhibition that Rosemary reappeared, wanting to again get involved with the local art scene,” recalls Phillda Njau who had curated that exhibition. “We were thrilled to include her in the show. After that she worked at Paa ya Paa as an artist-in-residency for three or four months,” Phillda adds. In a radio interview that the BBC Art House had with Rosemary in 1995, she explained how the following year she was commissioned to illustrate Amos Tutuola’s magical book, ‘The Palm Wine Drinker’ which subsequently led to her collage ‘illustrations’ going on display in Paris. Rosemary went to Paris as well. “It was the first time I had been on an airplane. I was 60 years old,” she told the BBC reporter. She was in Paris for a whole month. And shortly thereafter, her art was shown in London and later at the Studio Museum of Harlem in the US. What she said impressed her most about being abroad, especially in Paris, was seeing how much people appreciated art and honored the artists. She admitted it wasn’t that way in Kenya where her international reputation didn’t put bread on her table. In fact, Rosemary was primarily a sculptor at Makerere but got into creating collage out of colored papers, packaging and glue once she had no means of buying art materials, leave alone owning a kiln with which to burn the clay sculptures she’d once loved to create. At one point, even glue was beyond her budget. But having shown her young students how to make their own glue-like paste using flour and water, she realized the techniques she was teaching were also ones she could use to get back into her own art. In the Red Hill show, all of Rosemary’s collages are illustrative of the humble rural life that she once led, first while growing up in Meru with her mum, and then, later in life in Gatundu county where she’d taught for so long. 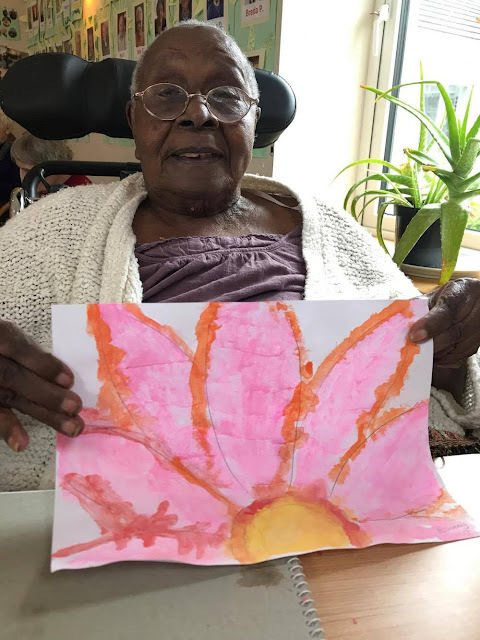 It was only after she’d retired from teaching that Rosemary focused all her energies on creating ‘paintings’ out of paper that told stories about everyone from shepherds, tea-pickers and farmers to water-carriers, lovely landscapes and wildlife. All of these are represented in the Red Hill show. But beyond the subject matter of her works, it’s Rosemary’s delicate technique that the Red Hill exhibition reveals. For unlike the first collages of Rosemary that I saw in the late 1980s which had been fashioned out of hand-shredded Revona soap and Unga flour packaging, the Red Hill works are made with scissors and finely-cut colored paper which she carefully assembled. The effect of her nuanced approach to color shading makes her collages look almost impressionistic. That’s to say the further back one stands from a picture the more it looks like a figurative work. Her meticulous attention to detail in form, design and coloration is worthy of the kind of honor that Rosemary saw Parisians give to their favorite painters, be they Renoir, Picasso or Degas. 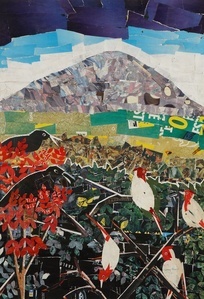 Currently, the Museum is said to own many more Rosemary Karuga collage works. One hopes that in future they can bring out all those precious collage ‘paintings’ by Rosemary and give them a permanent pride of place for the world to see. For if there is one Kenyan artist who deserves to be recognized, honored and even awarded by this country for her contribution to contemporary Kenyan art, it is Rosemary Karuga. And she deserves it now, in her lifetime. GREAT WORK THERE.GREAT HEROINE.MY GRANDMA.ALWAYS PROUD OF YOU.